Broadway, like most major routes in New York City, was built on top of a road made and used by the Lenape, the indigenous people who were displaced by the Dutch. 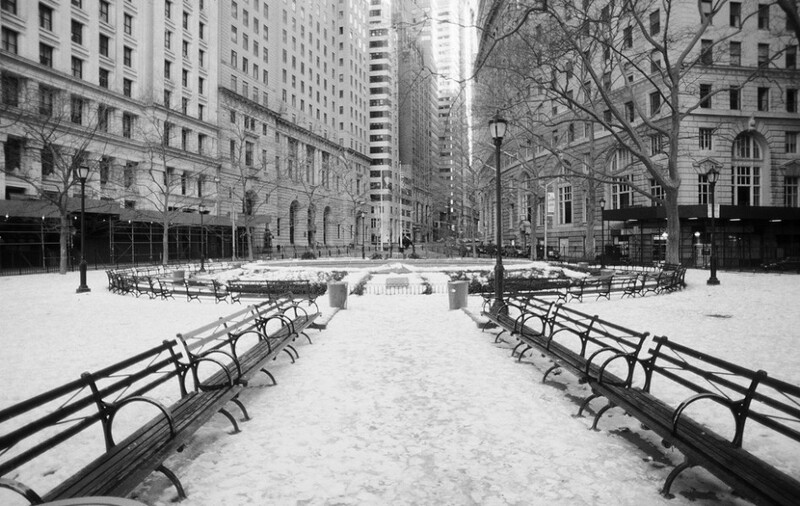 Wall Street is named for the wall that slaves working for the Dutch built to keep Native Americans and other colonizers out of the village of New Amsterdam. Broadway begins at Bowling Green, the center of that former Dutch settlement. De Leeuw’s book begins there too, proceeding northward against Broadway’s downtown traffic. Photographs of the west side of the street are printed on the left-hand page, the east side on the right. The book’s binding becomes an imaginary vanishing point for the journey. The pictures are accumulations of time and accidental knowledge. Invisible trams leave vaporous lines as they move past the camera’s open shutter. Most passersby are blurry and undefined—distant figures without detail—unaware of being photographed. Only those bystanders who notice the camera and remain still are in focus. In De Leeuw’s book, photographs of Broadway alternate with pages of advertising. One ad declares: “There are 1,500 Otis elevators on both sides of Broadway.” Dr. Scott promotes his electric hairbrush. An underwear manufacturer promises its underpants “will not annoy you.” Without explanation, small portraits of world leaders and diplomats appear in the margins. De Leeuw reprints a New York Times newspaper article stating that real estate prices on Broadway are as high as $4 a square inch. Most of the advertisements are for businesses on Broadway. They appear in the book just before or after the photo of the business itself. The business signs on the buildings in the photographs have been carefully retouched to make them more legible. Different types of businesses cluster together, selling hats, typewriters, corsets, railroad tickets, rugs. But one type of business can be found on the upper floors in all the districts—the private detective or “private eye.” What can be inferred about a city where one must pay for police work out of one’s own pocket? The Lumière brothers advertise photographic supplies on several pages. And below each of De Leeuw’s photographs there is a caption stating that the image was made from an “original Lumière Sigma Plate Photograph.” As a teenager, Louis Lumière developed a photographic process sensitive enough to stop movement. Freezing motion proved to be the key to reproducing its illusion. Every film, every photograph, is a document of its own making. The Lumière brothers’ camera weighed only 12 pounds. It also doubled as a projector. The Lumières used the illusion of motion to create spectacle from everyday life. They refused to market their camera. Instead, they sent agents all over the world, following established routes of colonization and trade, to film curious bystanders and then charge them admission to see themselves projected on-screen. These Lumière operators then copied the films and sent the originals back to the factory to be recopied and distributed to other operators to exhibit in other parts of the world. Over 1,200 films were made between 1895 and 1897. These films were known as actualités or actualities. Each actuality lasted less than a minute—the length of one roll of film. It was an extended moment of unbroken and repeatable time, a “view” of a place or event as if glimpsed through a transparent window. The films were edited by deciding when to turn the camera on and calculating when the film would run out. The magician Georges Méliès, attending one of the first public film screenings in Paris, found the trembling leaves on a tree in the background of one of the films more compelling than the infant being fed by her parents in the foreground. Méliès probably knew that on a sunny day the small circles of light we see between the shadows of the leaves on a tree are actually tiny projected images of the sun. Perhaps you’ve seen the crescent-shaped points of sunlight that appear on the ground during a solar eclipse. Actuality, actualité, aktuelletät, actualdad, attraction, distraction. on Broadway where women are allowed to eat: “Childs Ladies’ Lunch.” Women were discouraged from patronizing nickelodeons, penny gaffs, shop shows, kinetoscope parlors, electric palaces, and automatic vaudevilles. They were warned that they might be recruited for prostitution there, and men were cautioned that lone women at the cinema might be prostitutes. But once a woman did make her way inside a darkened cinema, she was in one of the few public places where she could avoid the gaze and scrutiny of others. By 1901, producers were editing actuality films, advertising that “all the least interesting portions have been removed.” In 1906, for the first time, more “story” films were produced than actualities. By 1910, when De Leeuw photographed both sides of Broadway, fictional film characters “spoke” to each other through written dialogue. Actuality filmmaking ceased. The overlapping field of vision of our two eyes creates a three-dimensional perception of the world in our minds. We are inside these images of the world, which, in turn, are inside us. We trust these images because they give us timely information. And just as we connect the image of one eye to the other, we also connect the images of one place to another and one day to the next. 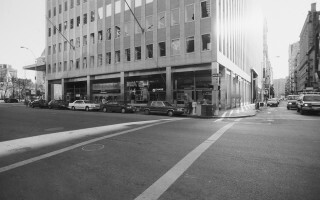 In January 2000, after I discovered De Leeuw’s Both Sides of Broadway, I walked from Bowling Green to Columbus Circle, photographing all the buildings on one side of the street. At 27th Street, a bystander became suspicious of me and told me I could not photograph there. As I pressed the shutter, he shoved me, pushing the camera into my face. In the time since I took these pictures, it has become illegal to photograph several of these buildings.